When Do You Really Need Reading Glasses? - CTS Wholesale LLC. When Do You Really Need Reading Glasses? There comes a time in everyone's life when they know for sure that it's time to crack out the reading glasses once and for all. Sure we may try to lie to ourselves for a while by squinting through the morning newspaper. We may even wonder why they changed the text to be so damn small now, but you can only live in denial for so long. #10 - You just turned 40 and you can no longer read the instructions on the back of the shampoo bottle (it's wash, rinse and repeat by the way). #9 - Your crows feet have crows feet from the amount of squinting that you do. #8 - Your arms seem to have grown shorter and you just can't seem to hold the morning newspaper far enough away from your face to make out the words. #7 - You started popping cherry flavored aspirins like candy to ease the headaches you get after reading. #6 - You couldn't thread a needle if you life depended on it. #5 - You no longer like watching foreign films because of all the words. #4 - You only shop for large edition print books on Amazon. #3 - When you get lost you now stop and ask for directions because you can no longer make out the street names on the map. #2 - The neighborhood kids think you're a detective because of the magnifying glass you always carry around. 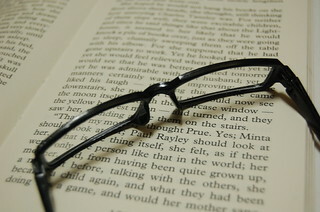 #1 - And the #1 sign you may need reading glasses is: Someone is reading this post to you right now.